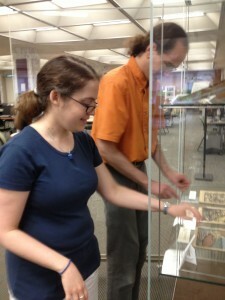 Today marks the opening of a new exhibit, both in the library’s display cases on the first floor and online. Paper for the People: Dime Novels and Early Mass Market Publishing describes the popular printed entertainment that was enjoyed by millions from the mid-19th century through the early 20th century. In a time before movies and television, dime novels and story papers were the best way to enjoy action-packed entertainment, and these adventures remain engaging and amusing (though often politically incorrect) today. The physical exhibit includes many rare materials from Special Collections, including a copy of the very first Beadle’s Dime Novel, Malaeska. The online exhibit covers history and evolution, popular characters and genres, readers and writers, and controversy about the form while also providing a bibliography of secondary literature and links to online digital versions of many vintage texts. For even more on dime novels, take a look at the Edward T. LeBlanc Memorial Dime Novel Bibliography at dimenovels.org, a project which aims to create an online database of every dime novel title ever published. While the project is still in its infancy, the database already lists more than 900 distinct series of books divided into several key categories.